External visitors – wish to join us and connect to our seminars? You may connect to the live seminar via *N SEBE VMP LES Seminars 52236958@deakin.edu.au [ID.36958] or via the methods listed HERE. For Deakin staff and students, please join via Skype for Business (Lync). Could not log in? More info on how to connect is available HERE. Please note that connection is only available while a seminar is taking place. As a courtesy, we request that when connecting to the seminar that you mute your microphone unless you are required to speak, this would ensure that the sound from the speaker to the audience is not disrupted by feedback from your microphone – thank you! ABSTRACT: Many human-induced environmental changes are potentially stressful stimuli to wildlife; often they are stressful but sometimes they aren’t. Distinguishing between whether they are or are not stressful is of prime importance for conservation. Monitoring the presence, dynamics, and strength of the physiological responses to stress in potentially affected individuals can help determine whether those individuals are adversely affected. In other words, stress physiology can tell us how well those individuals are coping with these stimuli. How those individuals respond to stress thus becomes an index for how problematic is the human-induced environmental change for that population and species. The ultimate goal is to use physiological responses to predict the health of individuals and populations that are at risk of extinction. 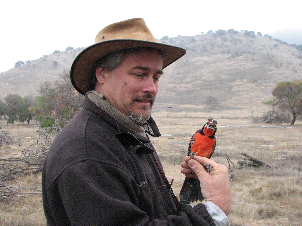 BIO: Michael Romero is a Professor of Biology at Tufts University in the United States. He has spent over 20 years studying stress, with an emphasis on understanding what causes stress in wild animals and how those animals successfully cope with that stress to survive in their natural habitats. His work has spanned studies on birds, reptiles, mammals and amphibians and recently culminated in a co-written book; “Tempests, Poxes, Predators, and People: Stress in Wild Animals and How They Cope”. Professor Romero is currently on sabbatical in Australia. Appointments with guest speaker may be made via Kate Buchanan.